So, I’m an instructional designer, with an emphasis on design. I learned about acronyms like AICC and SCORM purely in self-defense, so my eyes wouldn’t cross when I talked to developers. And honestly – it wasn’t that important for me to know that much about those standards because there was such a short list of things I could do with them. But xAPI is different, and it’s important for IDs to start wrapping their heads around it. There’s this thing that happened with SCORM – it could actually originally do a lot of different things, but as it got implemented, we started defining it very narrowly. We put ourselves in that small box and labeled it SCORM, and then decided it was necessary on the off chance that we might want to move a course from one LMS to another, which was pretty much missing the point. Basically, it’s like someone having a $50K budget for a new car, and spending a thousand dollars on the actual car and the other forty-nine thousand on making sure we always have a parking space. SCORM and AICC and all the ways we’ve previously tracked data out of learning experiences has focused on attributes of the courses – the course completion or the test score. Of course, there were end users involved, but the focus was on the learning material and not on the user. The xAPI format (Noun, Verb, Object) makes the whole thing focus on the user, and not on the course. This is a change of focus that is not only long overdue, but is going to shape the training industry model going forward. If you are a Learning & Development professional, you need to make sure you are getting out of the business of creating containers for information, and getting in the business of supporting people and businesses. Learning has never just happened in courses, but there are more places than ever for our end users to learn. We need to follow them, rather than expecting them to come to us. We’ve talked about WIIFM (What’s in it for me?) for years – it’s one of those things you always hear that you need to include in courses to persuade your learners to pay attention. I’ve started to think that’s a really unsatisfactory view of the world – most of the people I know don’t need a sales pitch to do their jobs, or to learn something to help them do that. Instead, they need to know that the thing they are learning is actually useful and necessary. I think we should talk about WCIDWT (What can I do with that?). If I have that knowledge or skill, what will I be able to do that I couldn’t before? People are carrying all the information in the world around in their pockets – they don’t need to learn more, they need to be able to do more. Just the fact that xAPI’s reporting format supports the idea of doing, of taking actions points us in the direction that we need to go. 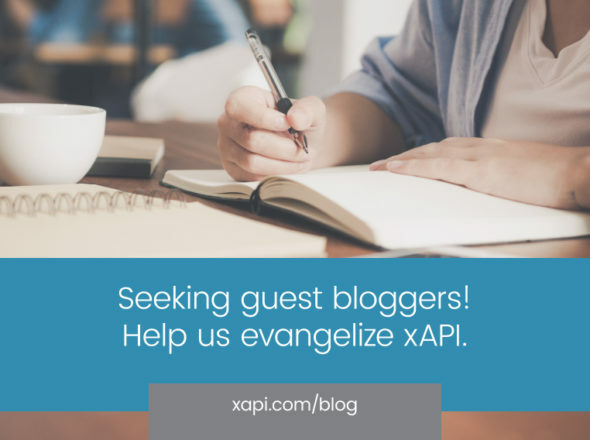 All the people who build the technology to support the work that we do are looking at xAPI and deciding how to implement it. Right now, it can do almost anything, but the parameters of use are being constructed as you read this. If you aren’t part of the conversation, then you don’t get a vote.